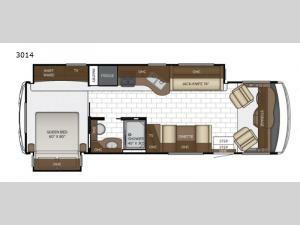 Set your sights to new destinations when you climb on board this class A motor home 3014 Bay Star Sport by Newmar! With a full wall slide out along the roadside you will be impressed with all of the space throughout this model! This model can easily sleep six people with the 74" jack knife sofa, dinette, and the rear queen bed. In the fully functional kitchen you will find a double sink, three burner range, and a refrigerator for your perishables! Imagine stepping inside a Bay Star Sport class A motor home and in the kitchen you are surrounded by solid-surface countertops and a mosaic backsplash. You can store your dishes in the glazed hardwood cabinets, plus there is a four-door refrigerator. Well, when you choose to travel and camp in a Bay Star Sport you no longer have to imagine what it would be like, you can experience the comforts and luxuries for yourself! In the bedroom there is an extra-large window so you can enjoy your view and you will find an LED TV where you can curl up on the bed and watch your favorite show or movie before drifting off to sleep. Along the exterior there are full painted graphics with a clearcoat finish plus lighted exterior storage compartments.